Central Station is located in the center of Amsterdam between canals and the IJ river. Trams are leaving from the station square to all districts in Amsterdam. Inside the railway station is a metro. Tram line 2 and line 5 are going to the Rijksmuseum (Rembrandt) and Van Gogh Museum. The journey takes 20 minutes by (4.5 km). Dam Square and the Red Light District are within 1 km from the railway station. Central Station was build between 1881 en 1889 and it’s architecture is simular to the The Rijksmuseum. The same architect (Cuypers) designed both buildings. In the Netherlands you need an OV-chipkaart (chipcard) to travel by train, metro or bus. You can buy a single use train ticket at the railway station. It’s also possible to buy a train ticket online. An e-ticket is easy but it must be printed to board the train. If you want to save money then you should use the website for daytrips of the Dutch Railways. Unfortunately the website is only in Dutch language. The site offers special deals and saves much money compared with using an OV-card. If you need travel advice, the Tourist Board and an office of the public transportation are outside at the Central Station square. You need a OV-chipkaart to travel in the bus, tram or metro. This chipcard can be purchased at the office of city public transportation (GBV) at the Central Station square or from a ticket vending machine. A paper day ticket in Amsterdam cost €7.50 for 24 hours. Near the main entrance of Central Station is a room with staffed desks where travelers can buy international train tickets. International tickets to Belgium, Luxembourg, Germany and France can be purchased from self-service machines or in the ticket room. 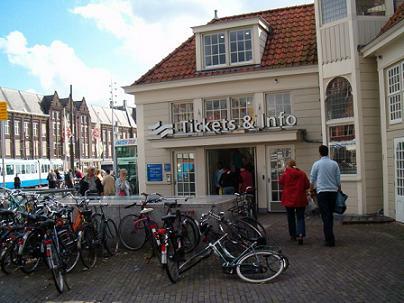 Train tickets to other European countries must be purchased at the office counter. All international trains depart and arrive at Amsterdam Central Station. If you travel to Belgium, Germany or with the Thalys high speed train to France you can use a mobile ticket. Last minute tickets and tickets in the low season have extra discounts. Cheap fares booked in advance for Amsterdam – Paris with the high speed Thalys train are €35 one-way.